U.S. EPA Administrator Scott Pruitt appears in an agribusiness video urging farmers and ranchers to comment on the proposed repeal of the Obama-era Clean Water Rule, promoting the rollback of a regulation that he sued to stop as Oklahoma attorney general. 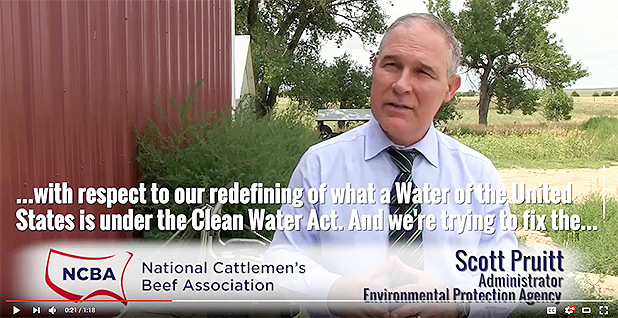 In the National Cattlemen's Beef Association video, Pruitt uses industry talking points to inaccurately describe the rule, also known as the Waters of the U.S. (WOTUS). The 2015 regulation was aimed at clarifying which wetlands and small waterways are protected by the Clean Water Act. The video directs viewers to BeefUSA.org for filing comments on the proposed repeal. The trade group's webpage says, "Take Action Now — Tell EPA to Kill WOTUS." It offers a link to the Federal Register and provides "sample comments" that readers can "copy and paste (or modify)." Pruitt's role in the video has drawn the attention of experts in government ethics. "This kind of behavior by an agency makes the rulemaking process seem like it is not really open-minded and that public participation doesn't really matter that much because certain commenters would be treated as more favorably than other commenters," said Jeffrey Lubbers, a specialist in administrative law at American University's Washington College of Law. In response to questions about the video, EPA issued a statement describing the logistics that went into its production. "As Administrator Pruitt says in the video, receiving public comments from across the country helps EPA make informed decisions on proposed rules," an EPA spokeswoman said. "Just like the Administrator's countless other interviews, there was no script and no cost to EPA to accommodate the National Cattlemen's Beef Association's request for a brief interview regarding EPA's State Action Tour and WOTUS." Asked whether EPA's Ethics Office had signed off on the video, the spokeswoman replied, "It's absurd that E&E thinks we need their permission on what media outlets we can accept interview requests from." Ed Frank, a spokesman for the cattlemen's group, described the video as an innocuous request for public comments. The video directs viewers to the group's webpage, he said, because "BeefUSA.org" is easier to remember than the Federal Register website. "It is part of [Pruitt's] outreach process. I don't think there is any specific agenda out there," Frank said. He added that environmental groups "can go out there and do the same thing. I don't know that there is anything barring them from doing that, aside from working out the logistics." 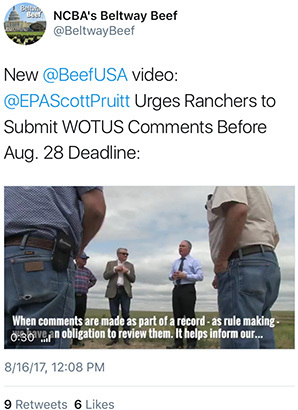 The video was filmed on a Colorado ranch during Pruitt's "State Action Tour." Frank said the cattlemen coordinated with EPA's Office of Public Affairs to score a "five-minute interview" with the administrator after a ranch visit that was arranged by the trade group. In the video, Pruitt addresses "farmers and ranchers across this country" and tells them that by repealing the regulation, EPA is "trying to fix it." "The Obama administration reimagined their authority over the Clean Water Act and defined a water of the United States as being a puddle, a dry creek bed and ephemeral drainage ditches all across this country, which created great uncertainty, as you might imagine," he says. But the regulation specifically lists puddles among features that are not considered waters of the U.S. and also specifies that it excludes dry creek beds that do not have a bed, bank and high-water mark and ephemeral ditches that "flow only after precipitation." Law professor Lubbers said Pruitt's misleading description of the regulation is inappropriate. "It sounds like he's made up his mind," Lubbers said. EPA did not respond to questions asking whether Pruitt is aware of the regulation's exclusion of puddles or why he describes WOTUS as regulating them. When it was proposed by the Obama administration in 2014, WOTUS immediately drew fire from farmers, energy developers and builders for what they said amounted to government overreach. Among their complaints was that the proposed rule could lead to the regulation of puddles. That's why EPA included an explicit exemption for them when it finalized the regulation in 2015. "The proposed rule did not explicitly exclude puddles because the agencies have never considered puddles to meet the minimum standard for being a 'water of the United States,' and it is an inexact term," the final rule says. "However, numerous commenters asked that the agencies expressly exclude them in a rule. The final rule does so." That didn't stop foes of the rule from continuing to say the regulation included puddles. Don Parrish, senior director of regulatory relations at the American Farm Bureau Federation, for example, says the rule's definition of puddles is too narrow. The rule defines a puddle as "a very small, shallow and highly transitory pool of water that forms on pavement or uplands during or immediately after a rainstorm or similar precipitation event." "I fully acknowledge that they technically excluded puddles, but they did so in a way to disadvantage and clouded a definition they intended to be narrow," he said. Pruitt only started describing puddles as regulated by WOTUS since being confirmed as EPA administrator. The lawsuit he filed as Oklahoma attorney general against the rule doesn't mention puddles, nor did public statements he made on the rule at that time. But shortly after his February confirmation, Pruitt began mentioning puddles in interviews and public appearances about the rule, telling the Conservative Political Action Conference that month: "We know with the previous administration, they took the Clean Water Act and made puddles and dry creek beds the subject of the jurisdiction of Washington, D.C."
That talking point has long irked environmentalists and supporters of WOTUS. "These are points that have almost no actual relationship to the truth," said James Goodwin, a senior policy analyst at the Center for Progressive Reform. Said Ken Kopocis, former head of EPA's Office of Water during the Obama administration, "You cannot say they are regulating puddles, not if you care what the truth is. He is using the talking points that the agriculture sector writ large has been using." Concerns about Pruitt's connection to the agriculture industry have abounded since President Trump picked him to lead EPA (Greenwire, Dec. 23, 2016). And law professor Lubbers said the fact that Pruitt has sued the agency over WOTUS makes his participation in the video problematic. As part of an EPA ethics waiver he signed in May, Pruitt agreed to recuse himself from the lawsuit he filed as Oklahoma attorney general over WOTUS (E&E News PM, May 5). But his waiver doesn't cover lawsuits other states filed over the regulation or the agency's efforts to repeal the regulation. Case law sets a fairly high bar for removing agency officials from rulemaking, with the U.S. Court of Appeals for the District of Columbia deciding in 1980 that "an agency member may be disqualified from such a proceeding only when there is a clear and convincing showing that he has an unalterably closed mind on matters critical to the disposition of the rulemaking." While the cattlemen video alone is unlikely to disqualify Pruitt from the WOTUS repeal effort, Lubbers said environmentalists could take him to court, arguing there is a "compounding effect" when the video is taken into consideration along with the lawsuit and Pruitt's other actions and statements on WOTUS. "It might not be successful, but there is an argument there," he said. 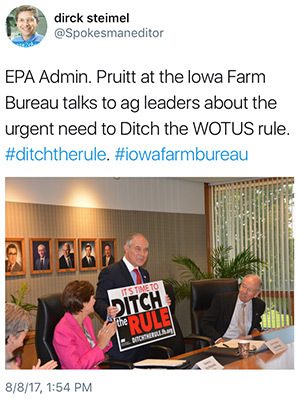 During a visit to Iowa last month, Pruitt was photographed holding a sign that says, "It's time to Ditch the Rule," using a slogan made popular by the American Farm Bureau Federation in opposing WOTUS. The photographs, taken during a closed-door meeting with Iowa lawmakers and members of the agriculture industry, were posted to Twitter. Natural Resources Defense Council attorney John Walke tweeted about the pictures, describing Pruitt as "*beaming* while holding industry's dirty water propaganda" and accusing Pruitt of "promoting the agricultural industry's social media propaganda campaign against EPA's Clean Water rule." This is not the first time EPA has come under fire for promoting WOTUS-related regulations. In 2015, at the request of Sen. Jim Inhofe (R-Okla.), the Government Accountability Office investigated EPA's use of social media to promote WOTUS in 2015 and found the agency was guilty of "covert propaganda" and "grass-roots lobbying." At issue was the agency's use of the social media platform Thunderclap, which enabled EPA to write the text of tweets that would then be sent out by other users. The agency's website also linked to an NRDC webpage telling readers to contact Congress about a bill that would prevent EPA from spending any funding on enforcing WOTUS. Stakeholders on both sides of the debate say Pruitt's actions do not amount to either "grass-roots lobbying" or "covert propaganda" but disagree on whether the Trump EPA is acting more inappropriately than the Obama administration. Liz Purchia, former spokeswomen for the Obama EPA who defended the agency's use of social media at the time, said Pruitt's involvement in the NCBA video is "much different from what we did to widely share information on social media about why it's so important to protect public health and our water resources with the Clean Water Rule." "Pruitt is doing promotional materials for an association to a targeted audience, which is trying to skew the comment process," she said. Inhofe took the opposite view. "Illegal attempts to manufacture public support and sway Congressional opinion can hardly be compared to a video encouraging public and stakeholder feedback during the open comment period," he said in a statement. Frank, the cattlemen group's spokesman, said the video was "a wholly NCBA effort." "They are totally different things," he said, arguing they would be more comparable if EPA itself linked to or promoted his group's video. The Farm Bureau's Parrish also argued that the Obama administration was similarly not forthcoming in describing what agricultural activities were regulated under WOTUS. "They would tell us all agricultural activities are exempt from the rule when they knew there were limits," he said. NRDC attorney Jon Devine said he did not have a problem with Pruitt "doing outreach" but noted that Pruitt has not appeared in videos encouraging those in favor of WOTUS to comment. "His outreach is entirely one-sided and deceptive," he said. "That speaks volumes about his closed mind on this issue. If he is going to only talk to opponents and mislead them in the process, he obviously has it out for this rule." Lubbers agreed, but he said he didn't agree with GAO's characterization of the Obama EPA's action. "They are doing the same thing," he said, "in terms of trying to get people to comment on their rule and to generate positive comments for what they are doing."